Copyright infringement has been a hot topic since the 18th century for print materials and exceedingly relevant for digital files since the era of Napster in 1999. In recent years, entities like copyright trolls and other digital watchdogs are always on the lookout to acquire significant monetary gain through litigious means, even if the accused is not the infringer but unknowingly provides the means to do so. For example, libraries safeguard against infringement liability by requiring patrons to acquiesce to not partake in ‘Conduct which violates Federal, State, or local law including copyright and licensing infringement. before using our internet services.’ Copyright Trolls frequently win cases against service providers, but a recent ruling is fighting this trend. On August 27, 2018, the United States Court of Appeals (Ninth Circuit) decided that the owner of a senior living home which provides internet service to occupants will not be held responsible for copyright infringement inflicted by an unnamed guest or occupant. Here is a synopsis by Stanford University Libraries and here is the Cobbler Nevada, LLC v. Gonzalez court publication itself. Whether or not the results of this substantial case will make any lasting changes to copyright policy remains to be seen. Scanning all kinds of material has become a common task thanks to the availability of devices like Flip-Pal and special phone apps like Pic Scanner for iphones or Google PhotoScan for android phones. But what do you do with a book that is nearly 6 feet by 7 1/2 feet when opened? The British Library recently faced this challenge when it digitized its copy of the 1660 Klencke Atlas, one of the world’s largest books. The library made a video of the process available on YouTube recently. The Klencke Atlas contains 41 wall-sized, extremely rare maps. These maps reveal what Dutch cartographers knew about the world during the High Renaissance period. 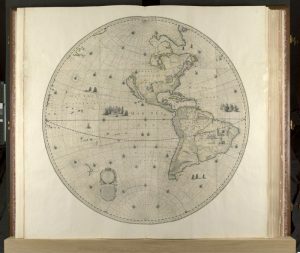 The public domain images of the atlas are part of the British Library’s Picturing Places online resource. If you are looking for a digitized collection of items closer to home, go the the MPPL digital collection Dimensions of Life in Mount Prospect. This collection includes an image of an 1873 map of Mount Prospect. Never stop learning. Whether you’re looking for college-level, professional development, or personal enrichment courses, Mount Prospect now offers hundreds of online courses that are accessible anywhere online, 24/7. Gale Courses offer well-crafted lessons, expert online instruction, and interaction with fellow students. Career & Professional Development: Many courses are tied to the Bureau of Labor Statistics’ fastest-growing occupations. Examples include: Accounting, Resume Writing, Business and Management, Grant Writing and Nonprofit, Real Estate, Healthcare, and Sales and Marketing. Computers & Technology: Courses cover all skill levels from beginner to advanced, even focusing on specific software applications. Examples include: Introduction to the Microsoft Office Suite, Database Management, Graphic and Multimedia Design, and The Internet. Personal Enrichment: A wide array of courses truly offers the opportunity to transform lives, whether related to hobbies, education, or life resources. Examples include: Children, Parents, & Family, Digital Photography, Health &Wellness, and Test Prep. Contact us at reference@mppl.org to learn how you can benefit from this great resource. Or visit http://mppl.org/webresources/gale-courses/ to get started. The Federal Communications Commission (FCC) has recently proposed rules regarding net neutrality or an open internet. They are seeking public comments to assist them in making these very important rules. Initial comments to these proposed rules opened on May 15 and will close on July 15. Replies to comments will be open until September 15. Comments (termed “filings”) may be submitted on the FCC website. Consumers Union: What is Network Neutrality?